Rain might have crashed down persistently, but it did not dampen that fun January morning in Starbucks a jot. Deafinitely Theatre's Artistic Director Paula Garfield was in need of the office at London's Diorama Arts Studios (which we'd previously used as our workshop space) so Andrew decided to treat us to coffee before getting back to - well, I'd call it dissecting our brains really, so hard did he work at stretching our imaginations. 'Without looking, how many people do you think are in this cafe?' he challenged us, and then it was, 'Give us ten things about this place in two minutes.' He seemed to work in ever-deepening layers, zooming into points of interest such as the two women chatting in the corner adjacent to ours, and getting us to create an imaginary character profile for each. From there he'd throw at us a situation with which to start the play, a second scene, additional characters and so on, encouraging us to develop our characters further. For my character - a 32-year-old self-centred, career-minded woman with South American roots called Juanita, who drove a 4-wheel-drive, rented a flat in London's Richmond, was not in a relationship and had no interest in children - Andrew decided that she had suddenly found herself pregnant after a one-night stand. And so it went on like that until each of three participants (one was unable to attend) had a lead character, a first and second scene - the latter which involved a dialogue with another character - and an ending, and they all drew inspiration from complete strangers in the cafe who had absolutely nothing to do with us. These were just exercises, not actual work on our monologues. No wonder we returned to Diorama Arts Studios with heads spinning. A more physical, but no less intensive, challenge presented itself to us in the afternoon, when we presented our second draft monologues as a performance - and this is where I found myself most conflicted. You see, I have a duality to my identity: my first language is English, because that's what I was first exposed to (I was born hearing, although I am pre-lingually deaf), I come from a family of writers and artists, and I grew up in the '70s when sign language was heavily oppressed. Yet my Deaf identity still managed to manifest itself in a variety of ways: through attending a partially hearing unit and then an oral deaf school (where I surreptitiously learnt the finger-spelling alphabet in a loo cubicle), being regularly cut off at the (hearing) family dinner-table, being oblivious to the jazz my mother often played on the radio, and finally finding myself more comfortable living, working and socialising with Deaf people. As a result I have plenty of BSL skills that I've picked up over the years, but they are rather mangled. Although I adapt according to the company I'm in, my tendency is to speak and sign, with my spoken English emerging as the stronger denominator. Interestingly, when I'm speaking in public, I'm inclined to lean on my BSL more. I find that I can project my 'voice' (note the colloquial marks) much more effectively that way. At least during my BSL gallery talks, I can, and do, rely on a little finger-spelling here and there for certain places and names. There is plenty of scope for ad-libbing too. But performing straight from an English theatrical script? That is something else. 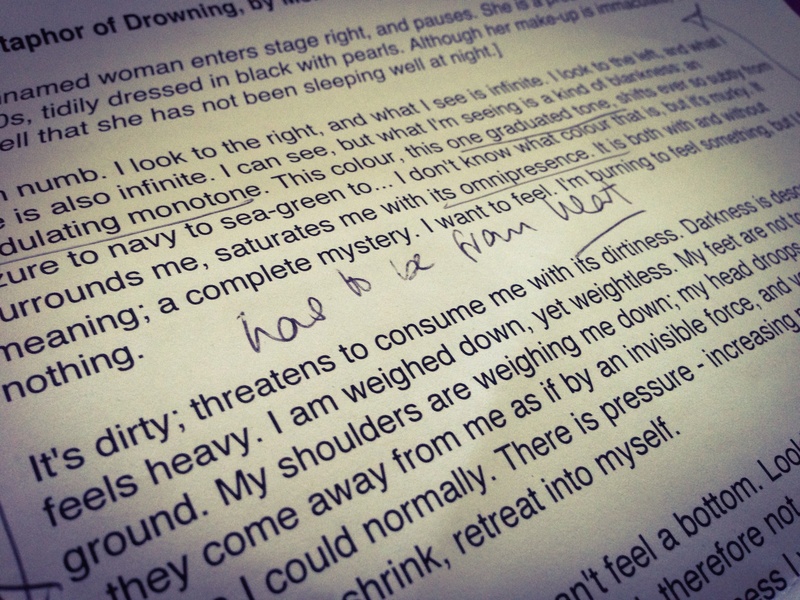 My own writing, like Sannah's (see earlier post) is steeped in the English language, in accordance with the mainstream MA studies I have undertaken - I am to date the only Deaf person to have completed and passed a Master of Arts postgraduate degree in Fashion Journalism and Promotion at Central Saint Martins. So in linguistic terms, my writing is very, very separate from how I express myself verbally - not just informally, but as a whole. So when I delivered my monologue, there were whole chunks - words, phrases - that I simply found it impossible to translate to BSL terms. I either finger-spelt those words or their first letters, mouthed them, or waved about vaguely. I lost the drama of my own written words in my delivery. Even though BSL is not his first language either, I could see that Andrew was picking up on this. But that was exactly my trouble. Where did my heart lie - with BSL, or English? Would I be demeaning my personal written English values if I tweaked the script so to be more BSL-friendly? So the dilemma I have just described was mine alone. I could understand perfectly why Andrew had asked us to perform our monologues ourselves. But I was torn, not just because of the inherent challenges in translating English to BSL without losing dramatic emphasis. It was also because the writing was mine, and I am not an actor.